This is a bit unofficial as I've not joined a team or set anything up on Ravelry but I am entering the spirit of the thing and spinning each day while the cycling event is on. 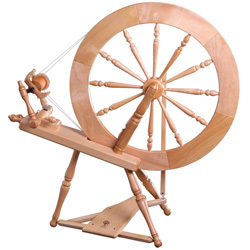 The daily spin will be very useful as I've really built up a huge stash of fibre, partly thanks to Wonderwool and partly thanks to a membership of Picperfic's luxury fibre club. Not a huge amount today as I've been out all day but have just been unwinding by spinning a bit of this lovely angora from Bigwig's Wardrobe at Wonderwool. 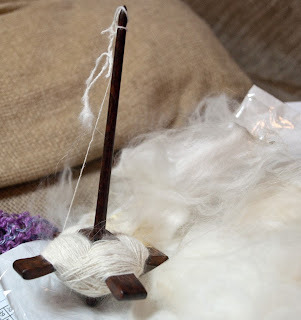 The very cute little spindle is from 1st class also Wonderwool. I've seen them at two previous shows and regretted not starting a collection. Are you taking part in TdF? Tell me about it in the comments - especially if you're blogging about it. I've also been taking part, and trying to make regular blog posts! So far it's been fun but hard work!